No 2K display for new Samsung Galaxy S5 smartphone | What Hi-Fi? The New York Times has learned that the Unpacked 5 event being held later this month by Samsung will indeed revolve around the unveiling of the new Galaxy S5 smartphone. The source for the newspaper – who supposedly has knowledge of the phone and has been briefed on specifications – went on to say the Korean company's new flagship smartphone will not actually include features that have so far been heavily rumoured. The main rumour that appears to have been quashed relates to the display, as many analysts had predicted the S5 will come with a Quad HD, 2560 x 1440 2K display. However, the source says this won't be the case and that, instead, the smartphone will come sporting a full HD, 1080p display. It is also claimed that the phone won't receive an eye-scanner, as previously predicted. 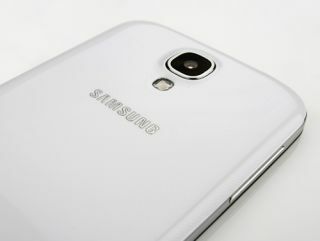 The Galaxy S5 will come with a camera and a processor upgrade, but specifications of these were not disclosed. Samsung is also expected to debut the new Galaxy Gear smartwatch alongside the S5 launch at MWC. As we approach MWC 2014, more rumours and predictions are beginning to surface. It also seems manufacturers are trying new, innovative features. HTC is expected to implement a twin-sensor camera with dual-LED flash into the new One flagship. Meanwhile, Apple is experimenting with sapphire glass and solar power technology in the development of the iPhone 6.